Prior to week 4, the Chicago Bears had been squeaking out some wins thanks mostly to their defense as quarterback Mitch Trubisky had been struggling this year. 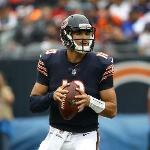 That all changed yesterday in the game against the Tampa Bay Buccaneers at Soldier Field when Trubisky led his team to a 48-10 victory as he passed for six touchdowns and 354 yards. Trubisky had a career game as he put some legitimate throws in the air against a Bucs defense that has allowed over 440 yards per game the last two weeks. But can he do that consistently enough for the Bears to succeed? Now that he’s shown what he can do when properly protected it’s more likely that opponents will begin to blitz him more. It will be interesting to see what happens the rest of the season as opposing defenses focus on pressuring him early and often to keep him from putting together another performance like this one. This season Trubisky’s play has come down to his performance under pressure. Against the Bucs that was the case once again as he was pressured in just four snaps. Interestingly in those four snaps, he was sacked once and was 0-for-3 in his passing attempts. But as the Bucs defense failed to keep the pressure on he settled in the pocket and made them pay dearly with the best performance of his short career. Trubisky rating from a clean pocket has been 107.0, which is the same passer rating as Green Bay Packers quarterback Aaron Rodgers. When he’s pressured though he’s fallen apart as his passer rating drops dramatically to 71.9. Going forward the Bears know that they can continue to count on their fantastic defense, but their season will be determined by how well Trubisky progresses from this week on. This game proved that the Bears do have enough weapons to allow Trubisky to flourish if he’s protected well enough. His performance against the Bucs showed he does have the potential to meet the expectations around him and lead his team to the postseason, but for that, he’s got to adapt and learn to avoid sacks and not make costly mistakes when he’s forced to scramble. Problem is, although the offensive line has performed well they can’t always protect Trubisky, therefore it all revolves around how well he responds to pass pressure. While he matures and figures out how to overcome his struggles against the pass rush the Bears must limit the situations that leave him unprotected. The Bears must find a way to keep Trubisky protected in the pocket to grant him that comfort level which allows him to spread the ball around and continue the level of play showed against the Bucs. If they do that, they have the potential to not only make the postseason, but even contend for the division title and, in the future, become one of the top teams in the NFC.